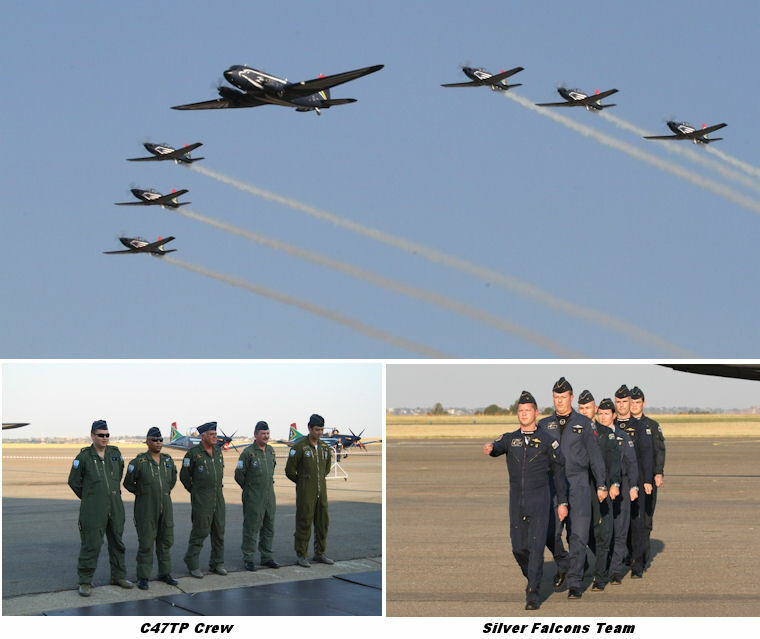 For a long time now the C47TP, 6840 that acted as the Falcons support element has taken a back seat to the more glamorous and sleek Pilatus PC 7's flown by the SAAF's formation display team, the Silver Falcons but that is all about to change all thanks to an initiative by Maj. Gen. Tsoku Khumalo. Starting out its life as a C-47 in 1944, “Gooney Bird” as it has now been named, was manufactured in 1944 and delivered to the USAAF in July of 1944 and transferred to the RAF later that month. In August of the same year she was transferred to the SAAF and saw duty in North Africa and Italy. In May 1992 she had her last flight as a C-47 and in 1994 she had her first flight as a C47TP and did service with 35 Sqn. at AFB Ysterplaat where she was used in the general transportation and freight role as well as para dropping and drogue towing during naval gunnery exercises. The C47TP is perfectly suited to the role of logistical support platform for the team as it is big enough to carry all the required personnel and equipment, yet is also capable of operating into and out of the many smaller airfields to which the team must deploy during an Airshow season. The striking livery of the Silver Falcons was an instant hit when it was introduced at AAD in 2008 and Maj Khumalo's initiative to have the C47TP in the same livery was completed just in time to introduce Gooney Bird to the expected 60,000 plus visitors that will flock to AAD 2012 and she is sure to become just as famous PC 7's.